The Blanco WW2 Museum contains an extensive collection of landmines deployed by the Germans in World War 2. 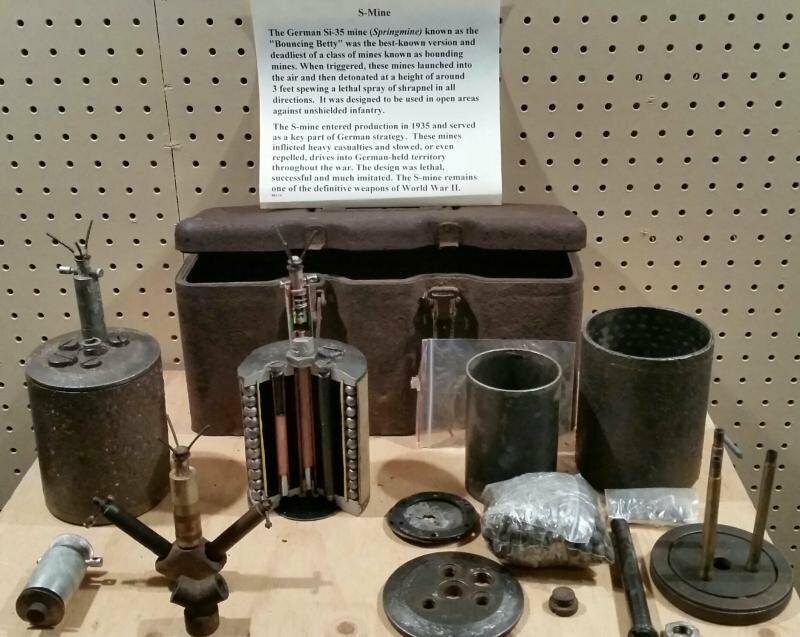 It is one of the few places where one can see an original portfolio of common mines running the gamut from the game changing "Bouncing Betty" to the last ditch “Stockmine.” The common thread of all of these was the terror potential that mines held for ground troops. Landmines had been a part of the battlefield for a good while, but the German brought the lethality of landmines to an entirely new level in WW2. They made extensive use of land mines as a combat multiplier in defensive strategies and frequently employed inter-connected bobby traps to further add to the misery of their enemy in dealing with them. Minefields are generally laid in definite patterns to aid in their removal when the time arose. As the Germans withdrew in the latter stages of the war they deployed mines randomly as a means of delaying the enemy with no regard for eventual removal. It was a safe bet that wherever Germans withdrew was sown with mines and booby-traps. To further the deterrence, the Germans introduced non-magnetc, wooden and glass mines which could not be detected by standard Allied minesweepers. German minefields were frequently Devil’s Gardens of regular, non-metallic and booby trapped mines designed to confound any effort to clear it without an extraordinary amount of time and effort. Most major battles in the ETO involved the effective use of landmines by the Germans. This was especially true in Italian Campaign where the harsh terrain was ideal for limiting an opponent’s advance with a combination of targeted demolition, landmines, and mobile reaction forces. In addition to serving as lethal obstacles, land mines also have a devastating pyschological effect on troops. The unknown factor that landmines introduce to the battlefield are as relelvant today as they were in WW2. The Teller Mine was the standard German anti-tank mine in World War 2. It went through several variations but it remained basically the same model with explosives sealed inside a sheet metal casing and fitted with a pressure-actuated fuse. It could be set with an anti-lift fuse to compound difficulty in removing one once deployed. Teller mines had a built-in carrying handle on the side for ease of transport, and for placement in a combat environment. While the mine was generally buried on likely avenue of approach, German Infantry were trained to attack tanks by flinging Teller mines directly in their path. As the name suggests (Teller is the German word for plate) the mines were plate-shaped. 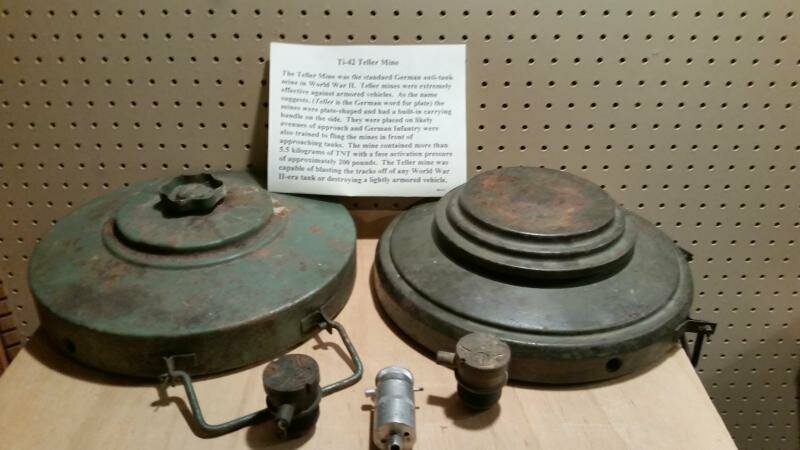 Containing more than 5.5 kilograms of TNT and a fuse activation pressure of approximately 200 pounds, the Teller mine was capable of blasting the tracks off of any World War II-era tank or destroying a lightly armored vehicle. Because of its rather high operating pressure, only a vehicle or heavy object passing over the Teller mine would set it off. 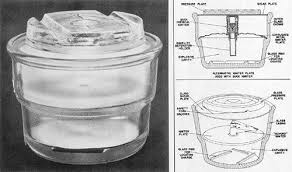 The Teller Mine could also be fitted with a timed fuse allowing it to be used as an explosive charge against tanks, pillboxes or other fortifications by assault troops. Teller mines were standard fare for German assault troops for their destructive capabity. T Mi Z 35 fuze assembly. This fuze was for the Tellermine 35 and required 4-600 lbs of pressure to fire the primer. he S-mine entered production in 1935 and served as a key part of German battle strategy throughout the war. 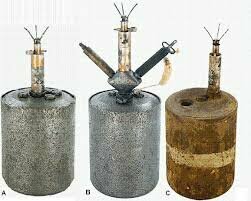 Known as the "Bouncing Betty" the S-Mine was the first of what became known as spring or bounding mines. When triggered a small charge would launch the mine to a height of around three feet before flinging out a lethal spray of some 360 steel balls and other shrapnel in all directions. The bursting radius was effective out to 250 feet. S-Mines changed the game as it was lethal to anyone in the vicinity when it went off. It could be triggered by direct contact or by trip wire to extend its coverage. It was particularly devastating to troops in the open. The German demonstrated a devilish ingenuity deploying S-Mines to their maximum lethality on the battlefield. The design was lethal, successful and much imitated. The Si-35 Mine remains one of the definitive weapons of World War II. The Schu-mine 42 was an anti-personnel blast landmine. 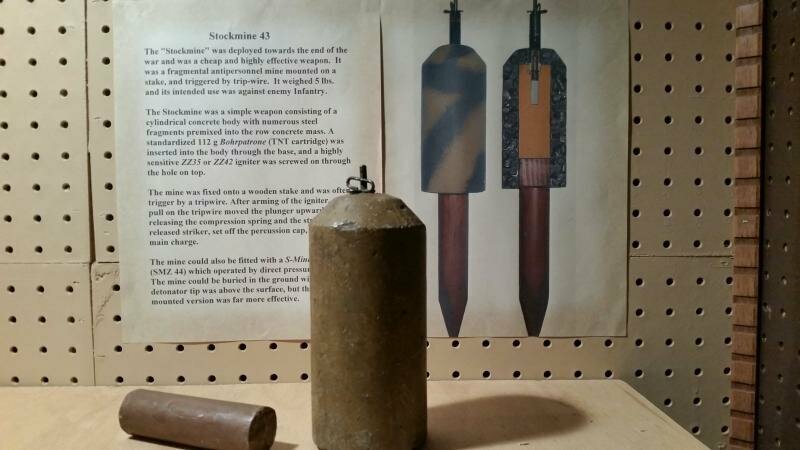 It consisted of a simple wooden box with a hinged lid containing a 200 g block of cast TNT.. A slot in the lid pressed down on the striker retaining pin, with sufficient pressure on the lid causing the pin to move, releasing the striker which triggered the detonator. 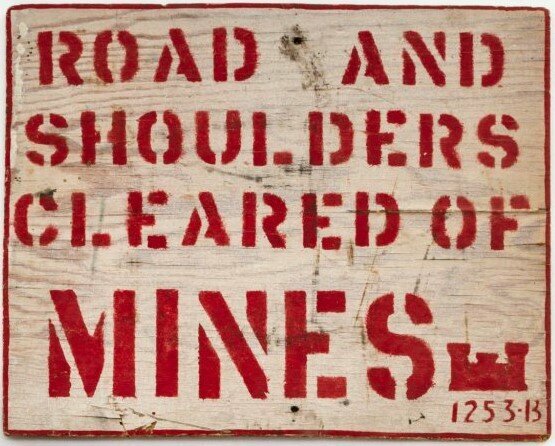 The mine was cheap to produce, and its wooden body made it more difficult to detect with early metal detectors. The "Stockmine" was deployed towards the end of the war and was a cheap and highly effective weapon. It was a fragmental antipersonnel mine mounted on a stake, and triggered by trip-wire. It weighed 5 lbs. and its intended use was against enemy Infantry. The Stockmine was a simple weapon consisting of a cylindrical concrete body with numerous steel fragments premixed into the row concrete mass. A standardized 112 g Bohrpatrone (TNT cartridge) was inserted into the body through the base, and a highly sensitive ZZ35 or ZZ42 igniter was screwed on through the hole on top. The mine was fixed onto a wooden stake and was often trigger by a tripwire. 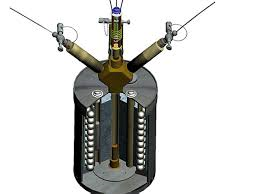 After arming of the igniter, a pull on the tripwire moved the plunger upward releasing the compression spring and the striker. The released striker, set off the percussion cap, igniting the main charge. The mine could also be fitted with a S-Minenzünder 44 (SMZ 44) which operated by direct pressure. The mine could be buried in the ground with only the detonator tip was above the surface, but the stake mounted version was far more effective.